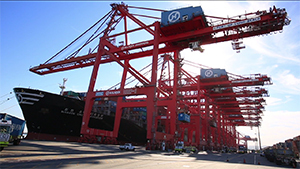 As peak season heats up, truck turn times are down at the Port of Long Beach.The average turn time in May was 78 minutes, a 15 percent improvement over February’s 92 minutes. Port CEO Jon Slangerup looks at how new vessel alliances and bigger ships will affect the Port of Long Beach. The Port’s incentive program for encouraging the greenest ships to call in Long Beach has been extended through June 30, 2017. The program rewards operators of ships with main engines meeting Tier 2 emissions levels with $2,500 per call. Ships with keels laid in 2011 or later meet Tier 2 standards. Tier 2 engines emit 15 percent less nitrogen oxides (NOx), smog-forming gases associated with respiratory problems, than older vessels. The reward jumps to $6,000 per call for ships with main engines meeting Tier 3 levels. Beginning in January 2016, newly built ships will be required to have Tier 3 engines. It could be several years before any of these new vessels call in North America. 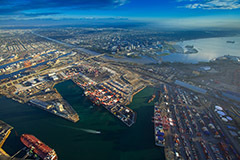 However, at the Port of Long Beach, the reward is an incentive for shipping lines to bring their Tier 3 vessels here sooner. Tier 3 engines reduce NOx emissions by 80 percent. 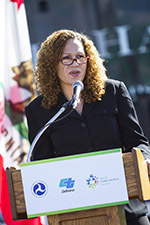 The Port launched the Green Ship Incentive Program in 2012. To meet 2023 Clean Air Action Plan goals, the Port aims to have 50 percent of its ship calls made by Tier 2 vessels and 40 percent made by Tier 3 vessels. 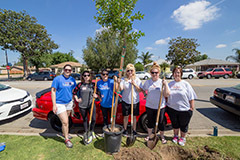 Long Beach City and Harbor Department officials broke ground July 8 on the new Civic Center at the future site of the Port of Long Beach headquarters. Staff is expected to move into the new facility at the corner of Ocean Boulevard and Magnolia Avenue in late 2019.